There are ample number of apps available in Google Play Store or other online store, either free or paid, either useful or useless. Some apps make your task easier and other makes RAM of your memory full. Even though you can uninstall it later, what about the data you have splurged on downloading it? Good news is, there are some apps which works as per their names and provides the features for which it was made. Nowadays wifi is common facility which is owned by any common man. You need to know some details regarding your network and devices connected to it, in order to enhance the network. So, it is now handy because of the app available in Google Play Store. 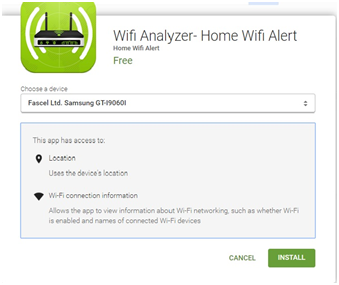 One network analyzing app is “Wifi Analyzer – Home Wifi Alert”, it works as the name suggests. Wifi Analyzer helps you to secure your network and maximize the connection speed using various tools included in this app. This is one of the must have apps for common people to IT specialist and network administrator. The main job this app does is to monitor any kind of network near around and check various parameters like, network speed, strength, etc using dozens of tools included in it. This is how you will find the app on Google Play. Here just clicking on Install, you can install it easily. After clicking on install, you will be asked to select a device and then the app will be downloaded in it. This app is supported in the devices having android 4.0.3 and up. After the installation you will be welcomed by the home screen. On the home screen you will see scanning button by which you can scan all the available network around you. You can also get the detailed information about it. Why Wifi Analyzer – Home Alert only? This app provides more than you can expect from a free version app. Speed testing tool is also integrated with this app. You can easily check the speed of your network. So, you don’t need to install speed checking app explicitly. You can also check the Mac address and IP address of all the connected devices using this app. To increase the speed of your network, you can check surrounded networks and channels. So, you can choose best from it. Now, What if you don’t want some specific person to use your network? Yeah, you can always change the password or key of your network but for more security , if the password is weak then you can block specific user using your network, using this app. Should You Pay for it or not? This app is free of cost, but developers also need to earn. So, they give ads to generate revenue. It is too irritating in cell phones that ad popping up on the screen. If you want to avoid this ad issue, you should go for paid version which costs only $0.99. This is the app containg 15 different function of various tools in one package. It is the first app providing facility to map your home network graphically. They have added MAC vendor look up on tools tab. The task of network analyzer is to analyses your network and gives the details like IP address, MAC address, the access points where you are currently connected etc. The main task of Wifi tester is that it will show you the strength of your Wifi network. The additional work which is done by this is it will also display your routers IP address. This is the most important feature of this app. This will give you all the networks which is in your range with their MAC address. Along with this, it also displays the single strength of those signals. This gives you what you need most. This feature provides you the best channel which will be your best option to set your wifi, so that you can get maximum reliability and speed. This displays the connections which are currently connected with your device. It also displays the foreign connections, listening IP etc. The best thing about this feature is that it will check established IP with 35 backlisted databases and display if your IP is trusted or not. This is the most unique feature of this WIFI analyzer. With the help of this feature, you can input unwanted MAC addresses to the router’s filter table, so that you can block device from using the internet. One more feature that attracts user towards this app is it provides the DNS lookup, Whoise data, ping/port scan host name etc. The support is essential to reach the wide range of customers. So in this wifi analyzer, they provide the 24*7 support. There are wide ranges of functions available in this wifi analyzer, so they provide free support to any new or professional person with any issues which they are facing. They will give the respond to any mail within 24 hours. So it is quite good. • The UI of the app is quite simple and interactive. 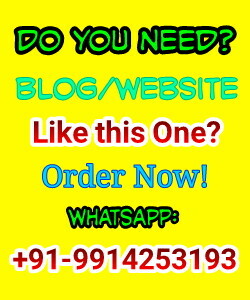 • 24*7 support if any tool of the app or other functionality is not working. • Blocking facility is also available. Sometimes, while scanning the networks, the app creates problem for devices. But it is not always the same case. Let me know if you face such issue with it. 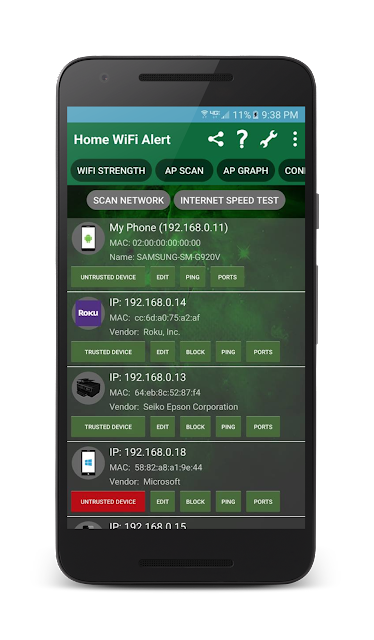 “Wifi Analyzer – Home alert” is the must have app for the users who want full control over their home wifi network. This app provides all the features which can be used by normal non-tech person to network technician to know the details of the devices and networks in surrounding. Blocking feature also keeps your network safe from unwanted sources. So, if you are using wifi facility, what are you waiting for? Get this app installed from Google Play Store and have full control over your network and enhance the speed of your network. If you have already used it, then feel free to comment your experience and if you have any question regarding usage of app then let me know via comments. Feel free to share this article, so other people also can get the benefit of this free app. Message: I hope that you have enjoyed '[Review] Wi-Fi Analyzer: Optimize and Monitor Your Wi-Fi Connection' article on Tips2secure. However, if you want me to deliver more items, then please share my post. You can use Social Sharing Widget provided at the end of every post. After all, Sharing is Caring!